Addition curing silicon hydro compatible for one-step-method dental impressions. 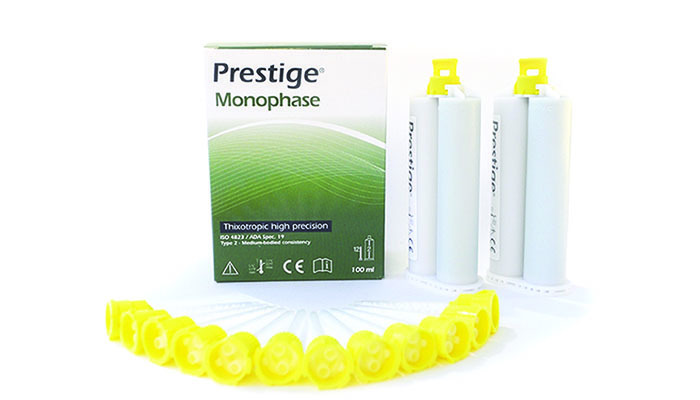 Prestige Monophase is a vinylpolysiloxane type material of medium viscosity (regular consistence) as a fluid for direct application onto the preparation or as a single material of uniform viscosity. The product complying with: ADA 19 (Type 1 Medium viscosity), e ISO 4832 (Type 2 Medium consistency). Working time: Max. 2 minutes.